Interesting, Rice goes with a guy who has not faced FAU this season and has just three appearances. We'll see how that decision holds up, but one thing is for sure it's never dull when the Owls face off - always some twist to be had. Weather not looking good for this weekend. "There's a 90 percent chance a subtropical or tropical cyclone will form in the central or eastern Gulf of Mexico this weekend, the National Hurricane Center said." FAU falls to Rice 5-4 in the day's first game after leaving 11 runners on base. Jared DeSantolo went 4-5 with an RBI and Gunnar Lambert and Andru Summerall each had home runs. Starter Jake Miednik lasted four innings, giving up two runs on four hits while striking out six Rice batters. The Owls, who outhit their opponent 8-6, will now have to return to try and stay alive against LA tech at 5:00 PM, weather permitting of course. The weather always ruins this tournament. Delays. Messes up planned pitching rotations. The gulf coast in May really is a bad idea. I know it is a central location, but c'mon man. PS…Rice sure knows how to win at tourney time. FAU baseball should start around 6:30. Maybe a bit before if they can get the field ready. The Golden Eagles fend off a feisty Roadrunner effort to remain in the winner's bracket. 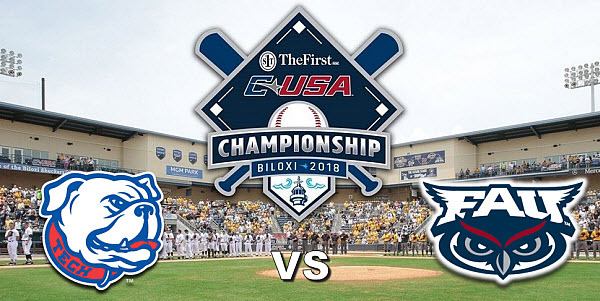 UTSA will take on Charlotte in an elimination game following the conclusion of FAU vs LA Tech. FAU fights back for 8-6 win over LA Tech to STAY ALIVE in the C-USA Championship! My prediction...There is no way that this tournament will end in completion. Too may games to get through. FAUSPORTS shows a 1:30 start.